Frostbite racing on the Chesapeake 2017: Exhilarating, awesome, amazing, windy, the best time of year to sail… these are only a few of the reasons frostbite racers give us when we ask why they continue to race all winter long (as their summer-loving counterparts stay home and make soup). Boat-traffic-free harbors and vivid blue winter skies also make frostbite racers’ lists of what to love about winter days on the Bay. For some clubs, such as the folks at Hampton Yacht Club, frostbite racing starts Halloween weekend and runs through Thanksgiving, which may make for a chilly day or two on the water, but not so biting, not yet frosty. Other clubs host fall “frigid digit” regattas that sometimes fall on 80-degree days! Then, the balmy fall ends. The cold blasts over our Bay; the water temperature dips. The hard-core frostbiters come out. These are the ones who layer up and head out with their Thermoses in hand and silly grins on their faces, who when faced with the prospect of snow flurries, will just shrug and say “Oh, well.” The rest of us are stoking the fires at home and planning to bake cookies, while frostbiters face frigid afternoons head on and gleefully. They can’t wait to get back on the water and see their frostbiting friends. Then, we have the true crazies: the dinghy sailors. These are the ones who own wet and dry suits and have very particular opinions on the warmest gloves—they often mention garden gloves you get at the hardware store or lobster fishermen’s gloves. Some sailors have odd waterproofing techniques such as layering plastic grocery bags over their neoprene socks before putting on their boots. They have favorite hats and tips and tricks for iced up lines. They revel in exchanging tales of heavy winds, capsizing, and chipping ice off the bow. In two decades of interviewing frostbite racers about their safety practices and what they enjoy about cold-water sailing, one thing is clear: they are welcoming. 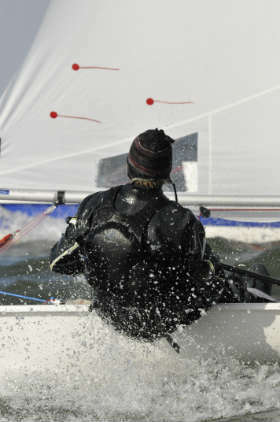 If you’re wondering if you, too, can try winter sailing, the answer is yes. All you need to do is reach out to one of the following clubs and see who needs crew. 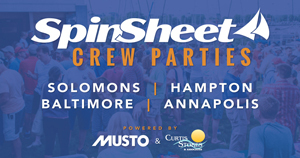 Annapolis Yacht Club: Racing Sundays through March. Downtown Sailing Center: Racing Saturdays through January. Hampton Yacht Club: Racing Sundays through November and Dana Dillon New Year’s Madness Race. Herrington Harbour Sailing Association: Racing Sundays through December. Potomac River Sailing Association: Racing Sundays through February. Severn Sailing Association: Racing Lasers and Laser Radials Sundays through April. Southern Maryland Sailing Association: Racing Sundays through November.